On a side note just before I get to the honey lime salmon that I’m sharing today — I made a video! I’ve been playing with the idea of making videos to go along with my recipes for a long time now and I’m finally finding the ‘umph’ to get them done. So yes…if you’d like to see more videos let me know and I’ll get it done! Cool? It’s leap day today! Do people do things on leap day? Is that a thing? I’m pretty sure my last leap day was spent on a plane from Manchester back to Arizona after visiting Mike here in Sheffield for the first time. It feels like that was forever ago, and yet it feels like it was last month. Time is bonkers. Enough with my musings – we’re talking honey lime salmon today and it’s currently my favorite thing in the world after this avocado tahini dip that I’ve been putting on absolutely e v e r y t h i n g . Don’t you love it when you suddenly remember a food that you’ve forgotten you love? Mike’s been telling me to put this recipe up for weeks now. This is a recipe that I really should have shared a long time ago, but somehow it just kept getting pushed to the side for one reason or another. Procrastination will be my downfall. 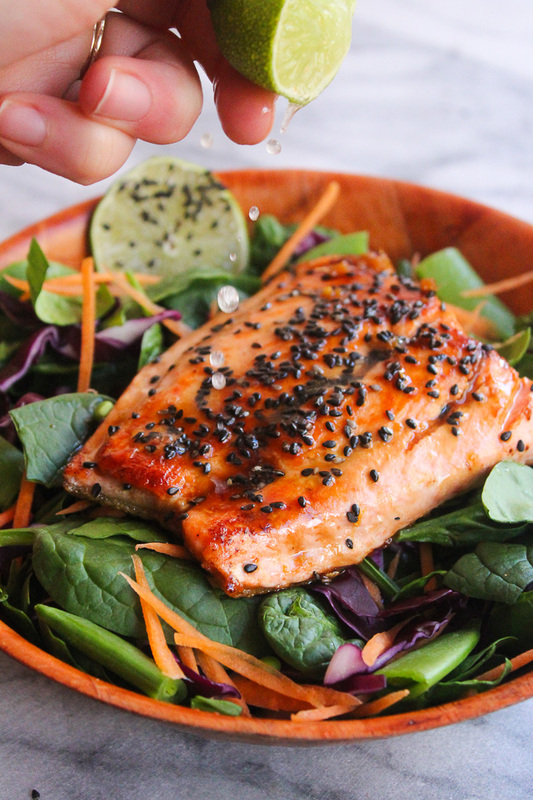 We’ve been eating a lot more salmon here lately hoping to fill up on healthy omega 3 fats. Mike’s arthritis has been playing up for some reason so I’ve been trying to make foods revolving around healthy fats and anti inflammatory foods to help combat the pain. Even if it doesn’t do much to stop the pain, at least we’ll have nice glowing skin from all the fish that we eat. 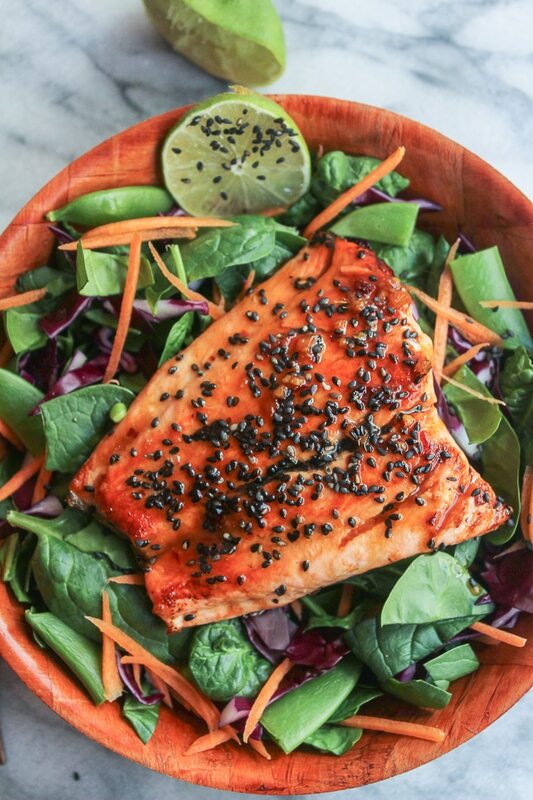 The salmon is pan fried quickly on the stove top with a five minute honey lime sauce that perfect for drizzling over a side salad or a bowl of sticky rice. All you need is about 15 minutes start to finish making it a perfect weeknight meal! Say hello to your new favorite salmon. Melt one tablespoon of the coconut oil in a frying pan on a medium heat. Once the pan is hot and spitting slightly add the salmon fillets skin side down. Let the salmon fry for at least 2 minutes without moving it so that the skin gets crispy. Check how it's doing and allow it to fry another 1-2 minutes before flipping it and frying the other side. Once cooked, transfer the salmon to a clean plate. Add the ginger, the chili flakes, and the garlic to the same pan, now empty and stir using a wooden spoon. Turn the heat up to medium and add the honey, the soy sauce. Add the starchy water mixture to thicken the sauce followed by the lime juice. Let it boil slightly to thicken. *Since coconut aminos have about 65% less sodium than soy sauce/tamari you may want to gradually add in a pinch or two salt to balance out the sweetness. Oh my goodness this sauce was amazing. Seriously I wanted to lick my plate. Definitely will be making this many many times. First of all: I love your recipes! I’ve just made this honey lime sauce and I was thinking I would like to prepare a larger quantity to keep in the fridge ready to use. Would it keep good? This was delicious! I served it with some zucchini noodles to mix in with the extra sauce. I forgot to add the cornstarch but it was fine without it. Such a beautiful recipes! Love salmon 🙂 Pinned! I love salmon, and this flavor combo sounds delicious! Thank you for sharing it at Savoring Saturdays! I love salmon fillets and this sounds really tasty with the sweetness of honey or maple syrup & all the herbs that add not only favor but have many health benefits, I always love using maple syrup and us it in many dishes as I do coconut oil Thanks for sharing on Real Food Fridays. Pinned & twitted! i havent had salmon in so long..such a beautiful looking filet.